Can you see a difference in these pictures? There is unwanted clutter in the first one. The photo at the top has a garden hose in the background, but I have removed the hose using the “clone stamp” and the results is seen in the bottom photo. 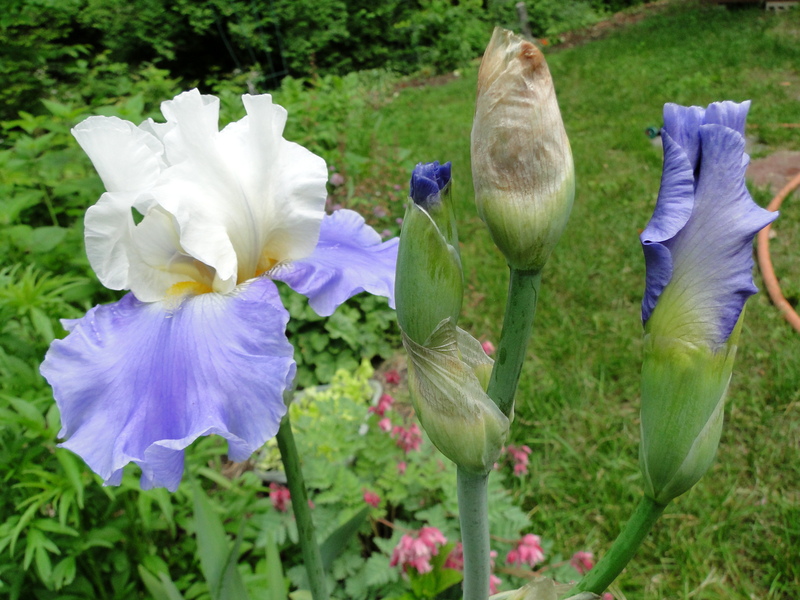 I just posted about my new, blue iris flowers that are growing in my garden and as soon as I published the post I noticed that I had not used the “good” picture. After photographing this flower I wanted to use the best pictures to make products for my online shop, but if I used this good photo of the flowers, there is a piece of an unsightly garden hose in the background. Fortunately I have learned how to remove unwanted stuff from my photos. With a little patience, I can usually get it to look okay. If you are interested in how I removed the garden hose from my photo, read a page I wrote at Wizzley to explain ♥ how to use the clone stamp in a free graphics program called paint(dot)net. And if you want to ♥ remove the entire background, for a transparent image, I can tell you how to do that too. I have to do that for many of the designs I make and sell in my stores. I need to practice removing whole backgrounds. I have such a shaky hand that it’s difficult for me. If you zoom into the image and do small areas at a time, it’s a bit easier. It’s time consuming and some things are easier than others, but the end product is very useful. I’m going to give it a try again.